UMSL student Letisha Wexstten (at left) won $15,000 two weeks ago in a campus competition for her business concept that aims to help people with disabilities find employment. Alex Zvibleman (second from left) won $10,000 for his coffee-shop concept, and Bailee Warsing (second from right) and Tim Bragg won $5,000 for the business they've co-founded, Singular Construction Automation. 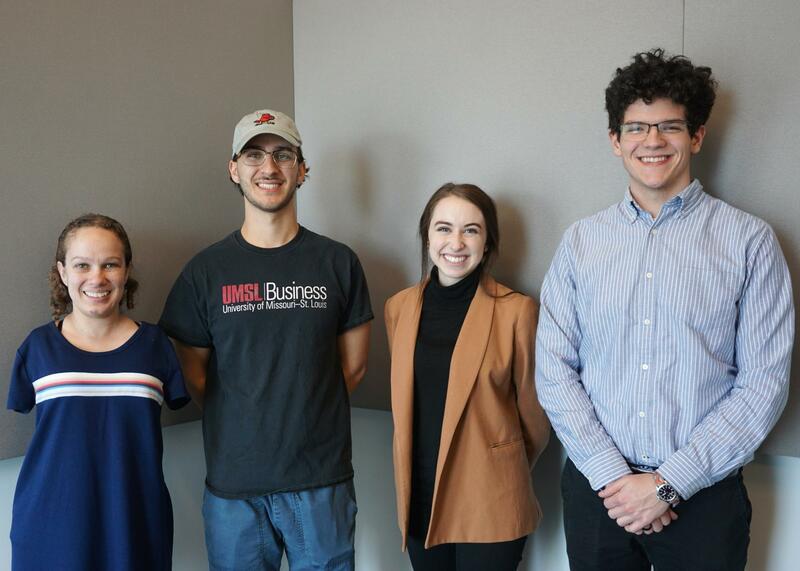 Wexstten was recently named the first-place winner of UMSL’s Entrepreneur Quest Student Accelerator competition, earning a $15,000 prize and garnering interest from investors. Alex Zvibleman, who won a $10,000 second place in the contest, told producer Evie Hemphill that his concept for a now-in-development coffee shop along Natural Bridge Road in north St. Louis County is focused on providing space for “interaction, socialization and collaboration” as well as coffee. While a variety of restaurants and other businesses and gathering places fill downtown Ferguson, Missouri, just a couple miles from campus, Zvibleman’s shop will be much closer to UMSL, along Natural Bridge Road. Third-place winner Tim Bragg, who co-founded Singular Construction Automation alongside fellow student Bailee Warsing, said his team set out to address a key need within the construction industry. The company’s first product will be an asphalt and concrete cleaning robot that Bragg said will help cut costs within the asphalt sealing industry and contribute to better road maintenance. Wexstten, Zvibleman, Bragg and Warsing are all headed to Columbia, Missouri, on Friday to compete in the UM System-wide competition, where they’ll have a chance to win more cash prizes. “St. Louis on the Air” brings you the stories of St. Louis and the people who live, work and create in our region. St. Louis on the Air producers Alex Heuer, Evie Hemphill, Lara Hamdan andJon Lewis give you the information you need to make informed decisions and stay in touch with our diverse and vibrant St. Louis region.